I just spent a week speaking English with my children. Although we are a German-speaking household, when my mother visits, I speak English with my children when she is around. Many say that this will confuse my children, at the very least, and could cause problems in other areas (identity, code-switching, etc.). Despite such warnings, this is the decision we have made as a family. In the end, we know that for us there is a lot more to raising multilingual children than just language. 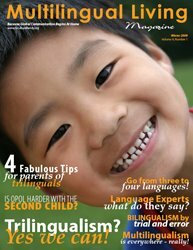 For us, raising multilingual children is also about raising multicultural children. Indeed, multilingualism is actually only one facet of this dual approach of language and culture. When it comes down to it, family is the most important focus for us. What is the point of it all if family members are disenfranchised and bitterness arises? What would our children think if a kind of "family feud" were to erupt because of our issues with language? This doesn't mean I completely give into the wishes of others (since in the end I don't think anyone really wants that). Instead, we all meet half way; a sort of compromise, if you will. This means that my mother accepts, and perhaps even encourages, us speaking German at home with our children but when she visits, I make the transition of speaking English with them and her so that she can be a part of it all. It took quite a few years to come to this decision and it was the Bilingual/Bicultural Family Network that helped us find the answer for our family. In the beginning, I was extremely resistant and my mother felt very left out and perhaps even a little lonely during our visits together. Despite our arguments, I know that deep down we were less angry with one another than feeling hurt and a little betrayed. It took many visits, inquiries into ourselves as to what language and culture meant to each of us and what, exactly, were the issues that were on our minds the most. My mother needed to hear why speaking German was so important to me. Sure, it seems obvious but it was important for her to hear it, to know exactly what it all meant to me. And I needed to know which aspects were bothering her the most and why. I had created all kinds of assumptions as to why she was upset but many of them were completely inaccurate. One solution could have been for me to speak German with the children when she was around and then translating everything. This was simply not an option for me. This is my mother. She is my flesh and blood. She raised me, cared for me my whole life and now I was going to translate to her what I just said to her grandchild in a foreign language! No, not an option for me. It is strange enough that I speak a foreign language to my children. However, I was also not going to pretend that when she wasn't around I continued speaking English with the children. I'm not sure that she would have even wished that I not speak German with the chidlren, but even if she had, it wasn't an option for me either. There is always the question of what would we do if my mother (or any family member or friend who didn't speak German) lived with us for an extended period of time? I'm not sure what the answer would be but I know that we'd all come together to discuss it and that we'd ultimately find a good solution. We'd find out how each felt about different choices and we'd find something that felt right for us all. No one winning and no one losing. Just a few humans finding their way along a less traveled path of language, culture, identity and diversity. No one said it would be easy but it is certainly interesting!